Sustainable Solid Waste Management in India: Recognition to modern day Alchemists! Recognition to modern day Alchemists! Waste managers are modern day alchemists! But, their work and the industry don't get deserved attention from the wider community! Alchemists tried turning base metals into gold and other precious metals, giving rise to today's Chemistry. Waste managers are however not just trying to, but are successful in turning "waste" into resources. 1. How do you understand or perceive the work you are doing in the context of our world's sustainable development goals? Context: "Sustainability is the ability to meet present needs without compromising the ability of future generations to meet their own needs". 2. What aspects of your work might the wider community be interested in knowing about? Context: Lack of recognition in the wider public generally leads to decrease in the flow of new talent in to the industry and to decreased investments on the long run. Keeping this in mind, if you decided to talk about your work with public for the next 5 years, what aspects of your work do you think they might be interested in knowing about? Hello Tenzin, thank you for approaching. I sent you an invitation on LinkedIn. Again, sorry for the delayed response. I've been busy with "be Waste Wise" for the past two years. Excellent! This can be a remarkable article by the way! I'm definitely going to do this submit. Cheers for the great Thought! Nice post. Looking forward to getting informative post like this . One more thing, I am glad to browse your blog. You can post your inputs/ questions as "comments" which will be automatically redirected to the author's mail. Please provide your email address to get replies directly to your inbox. 10. Maria Gaviota Velasco Perez Alonso, Nickolas Themelis. Generation and Disposition of Municipal Solid Waste in Mexico and Potential for Improving Waste Management in Toluca Municipality. Waste-to-Energy Research and Technology Council (WTERT). [Online] 2011. 11. Division of Technology, Industry and Economics. State of Wase Management in South East Asia, Types of Wastes - Sources and Composition. United Nations Environment Programme. [Online]. 12. European Environment Agency. Municipal Waste Generation Per Capita in Western Europe (EU-15), New Member States (EU-12), EU Countries (EU-27) and total in Europe (EU-27 + Turkey, Croatia, Norway, Iceland, Switzerland). European Environment Agency. [Online]. 13. United States Environmental Protection Agency. Municipal Solid Waste Generation, Recycling, and Disposal in the United States: Facts and Figures for 2009. United States Environmental Protection Agency. [Online]. 14. Factors Influencing Municipal Solid Waste Generation in China: A Multiple Statistical Analysis Study. Liu C., Wu XW. s.l. : Waste Management and Research, International Solid Wastes and Public Cleansing Association, 2011. 15. Perinaz Bhada, Nickolas Themelis. Feasibility Analysis of Waste-to-Energy as a Key Component of Integrated Solid Waste Management in Mumbai, India. New York : Earth Engineering Center, Waste-to-Energy Research and Technology Council, 2008. 16. Sustainable Recycling Model: A Comparative Analysis Between India and Tanzania. Bob Jan Schoot Uiterkamp, Hossein Azadi, Peter Ho. 3, s.l. : Resources, Conservation and Recycling, 2011, Vol. 55. 17. Kumar, Sunil. 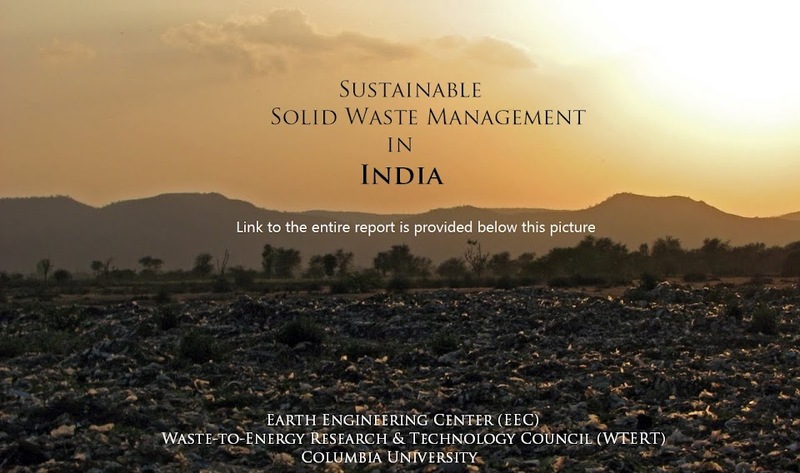 Municipal Solid Waste Management in India: Present Practices and Future Challenge. Clean Development Mechanism, United Nations Framework Convention on Climate Change. [Online]. 18. Solid Waste Management in India: Options and Opportunities. Shuchi Gupta, Krishna Mohan, Rajkumar Prasad, Sujata Gupta, Arun Kansal. 2, s.l. : Resources, Conservation and Recycling, 1998, Vol. 24. 19. CityMayors.com. The Largest Cities in the World by Land Area, Population and Density. CityMayors.com. [Online]. 20. Hennepin Energy Recovery Center, HERC. More Power than You Know. Inspector America, History Channel. 21. Urban Development Sector Unit, East Asia and Pacific Region, The World Bank. What a Waste: Solid Waste Management in Asia. Environmental Strategies for Cities, Massachusetts Institute of Technology. [Online] 1999. 22. The Use of Compost: Its Effects on Heavy Metal Levels in Soil and Plants. F. Pinamonti, G. Stringari, F. Gasperi, G. Zorzi. 2, s.l. : Resources, Conservation and Recycling, 1997, Vol. 21. 23. A. Gendebien, A. Leavens, K. Blackmore, A. Godley, K. Lewin, K. J. Whiting, R. Davis, J. Giegrich, H. Fenhrenbach, U. Gromke, N. del Bufalo, D. Hogg. Refuse Derived Fuel, Current Practice and Perspectives. Environment, European Commission. [Online] July 2003. 24. Bureau of Land & Waste Management, Division of Mining & Solid Waste Management. Regulation 67-107.12, SWM: Solid Waste Incineration and Solid Waste Pyrolysis Facilities. South Carolina Department of Health and Environmental Control. [Online] May 28, 1999. 25. United Nations Environment Programme. Solid Waste Management. Division of Technology, Industry and Economics, United Nations Environment Programme. [Online]. 26. An Assessment of Municipal Solid Waste Compost Quality Produced in Different Cities of India with the Perspective of Developing Quality Control Indices. J. K. Saha, N. Panwar, M. V. Singh. 2, Bhopal : Waste Management, 2010, Vol. 30. 27. International Energy Agency. Turning a Liability into an Asset: The Importance of Policy in Fostering Landfill Gas Use Worldwide. International Energy Agency. [Online] January 2009. 28. Nippon Koei Co., Ltd. Global Study for Purpose of Global World Bank Guidance Development: Solid Waste Management Holistic Decision Modeling. Earth Engineering Center, Columbia University, SOFOS Search Engine. [Online] June 2008. 29. Smith, Kirk R. National Burden of Disease in India from Indoor Air Pollution. Proceedings of the National Academy of Sciences of the United States. [Online] 2000. 3. Census of India, 2011. Census of India. [Online] 2011. 30. Jain, Rohit. Colleague, Friend. New York, 2011. 31. Poornima Chikarmane, Deshpande M., Lakshmi Narayan. Study of Scrap Collectors, Scrap Traders and Recycling Enterprises in Pune. Institute for Global Environmental Strategies. [Online] 2001. 32. Sarkar, Papiya. Solid Waste Management in Delhi - A Social Vulnerability Study. Earth Engineering Center, Columbia University, SOFOS search Engine. [Online]. 33. Central Pollution Control Board, India. Plastics Waste Management: Environmental Issues and Challenges. Central Pollution Control Board. [Online]. 34. Chintan Environment Research and Action Group, Safai Sena, The Advocacy Project. Cooling Agents: An Examination of the Role of the Informal Recycling Sector in Mitigating Climate Change. Chintan Environment Research and Action Group. [Online] 2009. 35. Khandelwal, P. K. Solid Waste Management in Delhi with Experience on Privatization of Collection and Transportation of MSW. The Associated Chambers of Commerce and Industry of India. [Online] October 24, 2007. 36. IL&FS Ecosmart Ltd. City Development Plan: Delhi, Solid Waste Management. Jawaharlal Nehru National Urban Renewal Mission. [Online] October 2006. 37. SNDT Women's University, Chintan Environmental Research and Action Group. Recycling Livelihoods: Integration of the Informal Recycling Sector in Solid Waste Management in India. GIZ, Deutsche Gesellschaft fur Internationale Zusammenarbeit GmbH. [Online] 2010. 38. Prime Minister's Council on Climate Change, Government of India. National Action Plan on Climate Change. Prime Minister of India. [Online]. 39. C., Sinha. Open Burning of Municipal Solid Waste: State level Analysis. s.l. : The Energy Resources Institute (TERI) Monitoring on Environmental Science, 1997. 4. Studies on Environmental Quality in and around Municipal Solid Waste Dumpsite. Arun K. Biswas, Sunil Kumar, S. Sateesh Babu, J. K. Bhattacharyya, Tapan Chakrabarti. 2, Kolkata, Nagour : Resources, Conservation and Recycling, 2010, Vol. 55. 40. Chaturvedi, Bharati. Chintan Environmental Research and Action Group. New Delhi, 2011. 41. Role of Informal Sector Recycling in Waste Management in Developing Countries. David C. Wilson, Costas Velis, Chris Cheeseman. 4, London : Habitat International, 2006, Vol. 30. 42. Poornima Chikarmane, Lakshmi Narayan. Rising from Waste - Organizing Wastepickers in India, Thailand and the Philippines. InclusiveCities.org. [Online] 2009. 43. Frank Keith, George Tchobanoglous. Handbook of Solid Waste Management. s.l. : McGraw-Hill, 2002. 44. Urban Organic Waste Markets: Responding to Change in Hubli-Dharwad, India. Nunan, F. s.l. : Habitat International, 2000, Vol. 24. 45. National Solid Waste Association of India. Urban Waste Management Newsletter. National Solid Waste Association of India (NSWAI). [Online] March 2010. 46. Composting Facility Personnel in Bengaluru, Pimpri, Nashik. Bengaluru, Pimpri, Nashik, 2011. 47. Srinivas, B. Municipal Commissioner of Suryapet. Suryapet, 2010. 48. J. Kurian, S. Esakku, K. Palanivelu, A. Selvam. Studies on Landfill Mining at Solid Waste Dumpsites in India. Sustainable Solid Waste Landfill Management in Asia. [Online]. 49. Arvind K. Jha, C. Sharma, Nahar Singh, R. Ramesh, R. Purvaja, Prabhat K. Gupta. Greenhouse Gas Emissions from Muncipal Solid Waste Management in India Mega-Cities: A Case Study of Chennai Landfill Sites. 2007. 5. National Environmental Engineering Research Institute, NEERI. Air Quality Assessment, Emissions Inventory and Source Apportionment Studies: Mumbai. New Delhi : Central Pollution Control Board (CPCB), 2010. 50. Mukherjee, Somnath. IL & FS Ecosmart Ltd. CDM Potential in Waste Management. 51. Woodbury, Peter B. Municipal Solid Waste Composting: Potential Effects of Heavy Metals in Municipal Solid Waste Composts on Plants and the Environment. Cornell Composting, Resources: MSW Composting Fact Sheets. [Online] Cornell University. 52. Heavy Metal Contamination of a Mixed Waste Compost: Metal Speciation and Fate. Mark Farrell, Davey L. Jones. 19, s.l. : Bioresource Technology, 2009, Vol. 100. 53. Joint Secretary and Mission Director (JnNURM), Ministry of Urban Development, Government of India. Jawaharlal Nehru National Urban Renewal Mission (JnNURM) - A Response to India's Urban Challenges. Asian Development Bank. [Online] July 6, 2010. 54. Nema, Asit. Technological Challenges in Municipal Solid Waste Treatment. Foundation for Greentech Environmental Systems. [Online]. 55. Electricity Generation from Rice Husk in Indian Rice Mills: Potential and Financial Viability. T. Kapur, T. C. Kandpal, H. P. Garg. 5-6, New Delhi : Biomass and Bioenergy, 1996, Vol. 10. 56. Timarpur Waste Management Company (Pvt.) Ltd. Petition for Tariff Determination for Municipal Solid Waste (MSW) Projects. IL & FS Waste Exchange. [Online]. 57. Abramowitz, Jeremy. The Benefits of Burning. WastedEnergy.net. [Online] May 3, 2010. 58. Sastry, D. B. S. S. R. Composition of Municipal Solid Waste - Need for Thermal Treatment in the Present Indian Context. Earth Engineering Center, Columbia University, SOFOS Search Engine. [Online]. 59. Ragothaman, K. Board of Director, Avant Garde. Chennai, 2010. 6. Kumar, Sunil. Effective Waste Management in India. INTECH CROATIA. 2010. 60. Themelis, Nickolas J. An Overview of the Global Waste-to-Energy Industry. Earth Engineering Center, Columbia University. [Online] July-August 2003. 62. Sastry, D. B. S. S. R. General Manager, Ramky Enviro Engineers Ltd. Hyderabad. 63. Seetha Ramarao, D.V. Ramky Enviro Engineers Ltd. Hyderabad. 64. Hefa Cheng, Yuanan Hu. Curbing Dioxin Emissions From Municipal Solid Waste Incineration in China: Re-thinking about Management Policies and Practices. Guangzhou Institute of Geochemistry, Chinese Academy of Sciences. [Online] June 12, 2010. 65. Zelnio, Kevin. Evolutionary Biology Needs Viral Marketing. Blogs.ScientificAmerican.com. [Online] October 22, 2011. [Cited: October 22, 2011.]. 66. Claire Barlow, Waseem Iqbal, Simon Ashton. Landfill Mining. Student-run Computing Facility. [Online]. 67. Ministry of Urban Development (MOUD), Government of India. Solid Waste Management Manual. New Delhi : Ministry of Urban Development, 2000. 68. Rajeev, R. A. Successful Registration of CDM Project for Earning Carbon Credits. Mumbai : Municipal Corporation of Greater Mumbai , 2010. 69. Economic Evaluation of a Landfill System with Gas Recovery for Municipal Solid Waste Management: A Case Study. Sudhakar Yedla, Jyoti K. Parikh. 2001, International Jounral of Envrionment and Science, pp. 433-447. 7. Department of Economic Affairs, Ministry of Finance, Government of India. Position Paper on the Solid Waste Management Sector in India. Public Private Parternships in India. [Online] November 2009. 70. Success Stories, PPIAF. Public-Private Partnerships: Maldives, Solid Waste. Washington DC : PPIAF, 2011. 72. Esha Shah, Kasturba Sambaraju. Technical and Economic Analysis of Composting Enterprises in Bangalore - India. Sustainable Sanitation and Water Management. [Online] December 1997. 73. Kunwar, Rajendra. Coal for Steam Raising in Alumina Refinery. Alumina Technology. [Online] January 28, 2011. 74. NALCO May Shutdown Alumina Refinery on Coal Shortage. www.investorvillage.com. [Online] July 2008. 75. Caroline Friedman, Teresita Schaffer. India's Energy Options: Coal and Beyond. Center for Strategic & International Studies, South Asia Monitor. [Online] August 29, 2009. 8. Kant, Ravi. Managing Director, Ramky Enviro Engineers Ltd. January 2011. 9. Ministry of Urban Development, Government of India. Guidance Note: Municipal Solid Waste Management on a Regional Basis. Ministry of Urban Development, Government of India. [Online]. Earth Engineering Center & Waste-to-Energy Research and Technology Council, Columbia University. Travel theme. Powered by Blogger.